Easy Banana Bread made with ripe bananas and sour cream is the PERFECT combo of moist rich and fluffy, and ready in only 60 minutes! 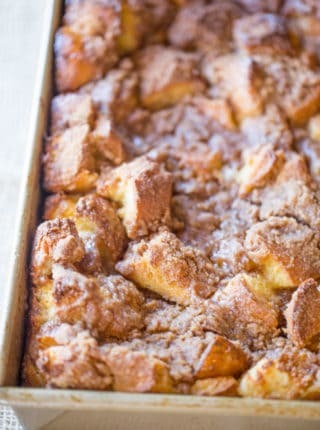 Our kitchen is on baking mode this week, and we’re making all of our favorites like Cinnamon Rolls and Apple Crisp! Easy Banana Bread is super simple to throw together on the weekend and grab all week for breakfast. Plus it’s super kid-friendly. I’m not kidding when I say that this is the BEST banana bread recipe I’ve tasted. 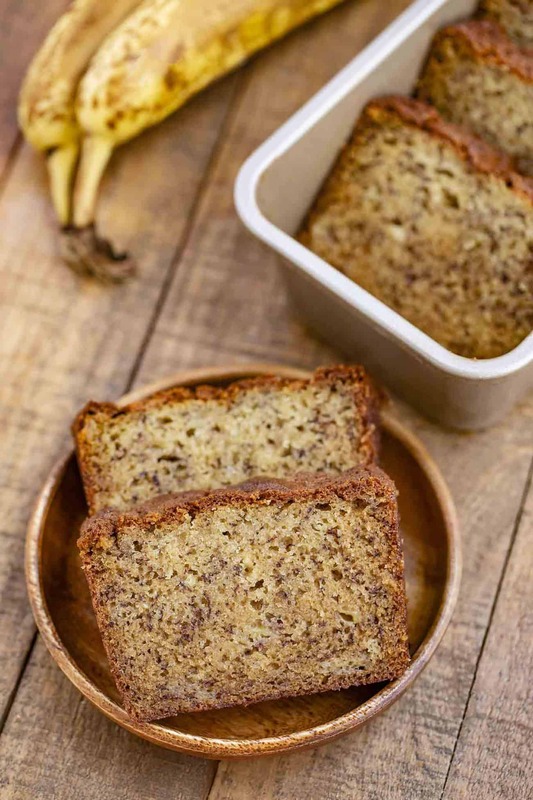 You can make a few different versions of this banana bread recipe by adding a handful of semi-sweet chocolate chips or a teaspoon of cinnamon to the batter. I’ve even added cocoa powder with the all purpose flour to make chocolate banana bread! Plus the kids love helping me add the chocolate chips to the bread. HOW DO YOU MAKE BANANA BREAD MOIST? The real secret to this banana bread recipe is the sour cream. That coupled with the mashed bananas is what makes this the most MOIST banana bread you’ll ever have in your life. You can use low fat sour cream to cut back on some of the calories, or swap it out entirely for applesauce, but you’ll lose some of the insanely soft texture. HOW SHOULD BANANAS LOOK FOR BANANA BREAD? 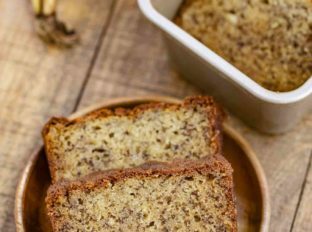 To get that great banana flavor in your banana bread recipe, you want the bananas to be as brown as possible, without becoming rotten. It’s the delicate balance between over-ripe brown and way too mushy brown. Your bananas should be completely brown with practically no yellow left, with a sweet aroma. The more ripe your bananas are, the better sweet banana flavor you’re going to get in your banana bread, and the easier they’ll be to mash. 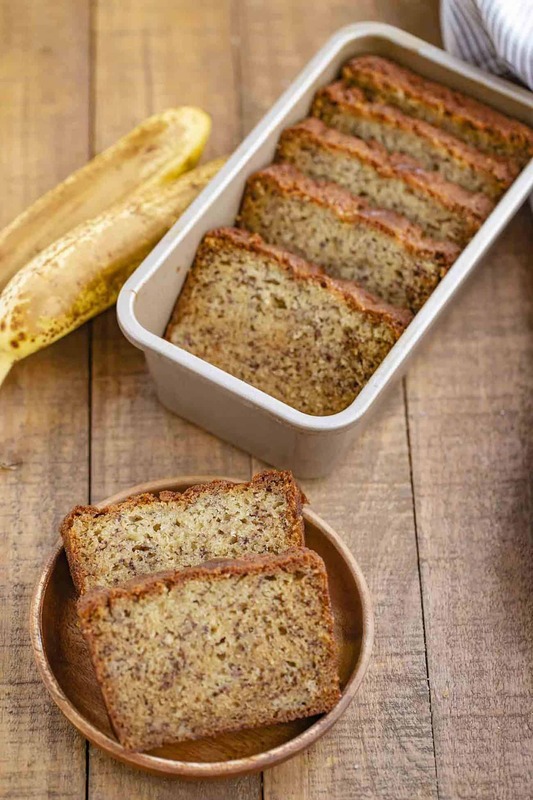 CAN BANANAS BE TOO RIPE TO USE IN BANANA BREAD? There’s a fine balance between ripe bananas and rotten bananas. If they’re past brown to black, throw them away. You also want your banana to be softer than the usual firmness, but not completely mushy. If it is difficult to peel the banana because of how soft they are then it’s too soft. HOW DO I MAKE BANANAS RIPEN FASTER? There’s a few ways to make bananas ripen faster. First, you can place them in a paper bag and leave them alone in a warm area for 1-2 days. The peels create ethylene gas, which fills up the bag and helps them turn brown faster. If you don’t have time to wait for the paper bag method, try baking whole bananas at 300 degrees F for 20 minutes, or until they turn brown/black. Make sure you cool them completely before using them in banana bread. We’re using large eggs in this banana bread recipe, you don’t want the hot ingredients to start cooking them in the batter. WHY DOES MY BANANA BREAD LOAF FALL? A banana bread recipe can fall for a few reasons, mostly to do with measuring the ingredients. If you used too much baking powder, expired leavening agents, or over mixed the dough, your banana bread will have rising and texture issues. Also make sure you follow the directions step-by-step. You want to mix your all purpose flour with the other dry ingredients to make sure they’re evenly dispersed. And lastly, make sure you keep a constant even temperature while it’s baking. Resist the amazing aroma of banana bread baking in the oven and leave the door closed until it’s almost done. Also, invest in a good quality loaf pan for even heat distribution. Your banana bread recipe will thank you. HOW DO YOU STORE BANANA BREAD? Wrap your banana bread loaf tightly in plastic wrap and store at room temperature for 3-4 days. I usually just leave it in the loaf pan. You can also cut the banana bread into slices and store it in an airtight container. Don’t store bread in the refrigerator as it will go stale faster. Make chocolate banana bread by replacing some of the all purpose flour with cocoa powder, and adding chocolate chips to the batter. Melt chocolate chips in the microwave and drizzle over finished loaf. 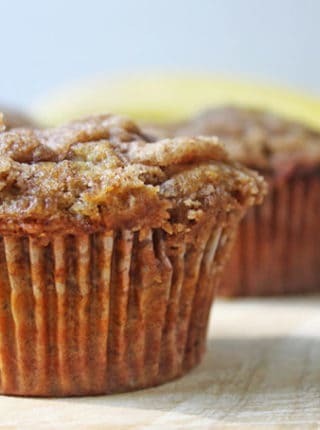 Use this banana bread batter in a muffin tin for banana bread muffins! 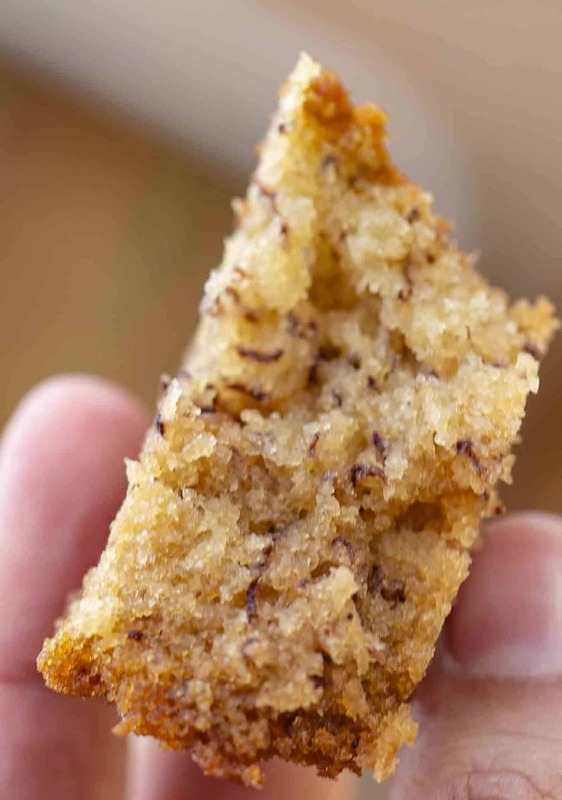 Swap 1/2 cup of sugar for brown sugar to add a deeper brown sugar banana flavor and brown color to the loaf. Swap the all purpose flour with whole grain flour or cup for cup gluten free flour for a healthy alternative. Cook the butter until it browns, then let it cool before adding it to the dough for a really nice browned butter flavor. 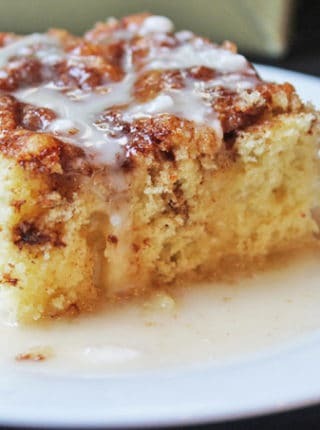 Drizzle the top of this banana bread with honey, icing, or a dusting of cinnamon for a decorative look. You can also add some crunch to your banana bread by adding 1/4-1/2 cup walnuts. Mash your bananas in a food processor to make banana bread faster. Easy Banana Bread made with ripe bananas and sour cream is the PERFECT combo of moist and fluffy, and ready in only 60 minutes! Preheat oven to 350 degrees and butter and flour a 9x5 loafpan. 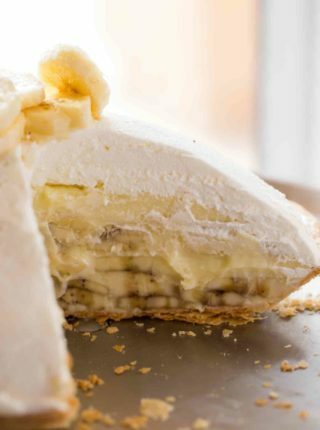 In a large bowl, whisk together butter and sugar before adding in the eggs, then the vanilla, then the sour cream and finally the bananas. Add the flour, baking soda and salt, whisking it until just combined into the butter mixture until smooth. Add the mixture to the loaf pan and bake for 60 minutes or until a toothpick comes out clean. I lost my mothers banana bread recipe and it was the best. I finally found what could be the recipe she used. Thanks! This makes me so happy, Rhonda! A favorite in our house. Banana Bread is the best!!! It really is, isn’t it?! Too many ingredients. Check the recipe for using: Jiffy yellow cake mix, 3 eggs, 3 ripe bananas, 1/2 cup of oil. Put them all together in one bowl, stir until mixed, put in a 350 degree oven for 45-50 minutes. 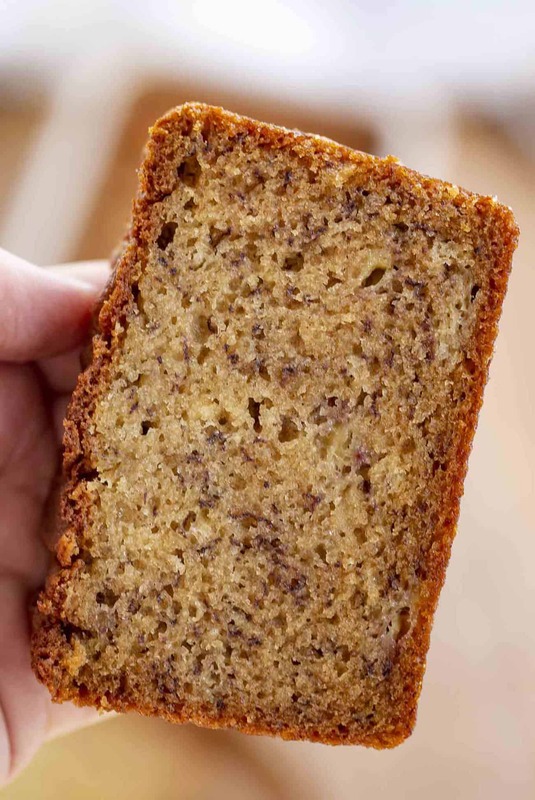 That’s all there is to the best light and moist banana bread you’ll find….. I generally liberally add chopped walnuts, but hey, that’s the way that I like it. Thanks for the suggestion but I was trying to show how easy it is to make without using a store bought mix. This was a huge hit! Thanks for the tips for making the bananas ripen faster! You’re welcome! Sometimes we all need to get to that banana bread as fast as we can, haha! Oh yum! We are Banana Bread lovers here! This banana bread recipe is the best!! We can’t get enough. So simple and flavorful.